This was originally a Blue Apron Recipe and their version was pretty good, but hubby and I dissected it and made it even better! Hubby absolutely hated their tartar sauce, but that was a pretty easy fix. 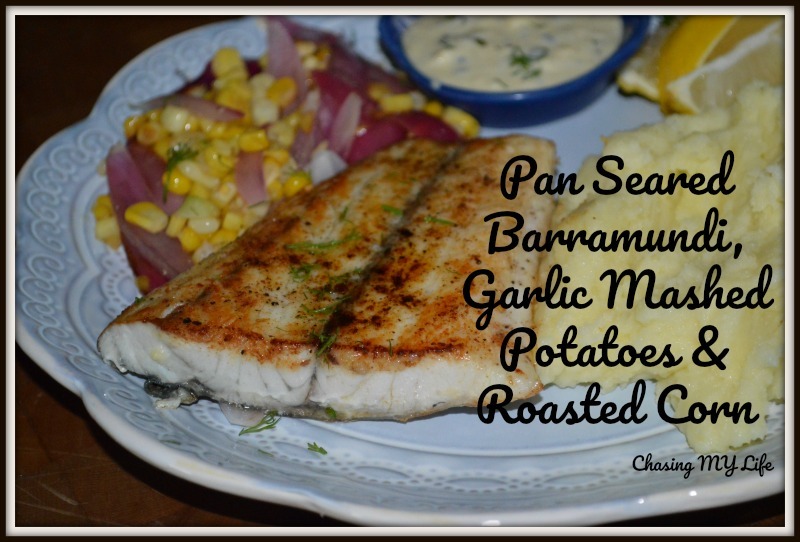 Barramundi or Sea Bass itself has an almost sweet buttery flavor and a delicate flakiness that can be seriously enhanced with the right seasoning. Mix all 6 ingredients together until well blended. Add the potatoes and garlic. Cook about 15 minutes until fork tender. Place butter in bottom of still warm pan. Rice potatoes over the butter. Add heavy cream and stir together until smooth. Cut the corn off the cobs. Over medium high heat melt butter and GHEE. Add onions, cooking a couple minutes until beginning to soften. Add corn to pan and cook 4-5 minutes until sizzling and starting to brown. Add apple cider vinegar and dill, stirring to mix. Score the skin side of the fillets. Pat dry and generously season both sides with salt, pepper and paprika. Add fillets to sizzling butter skin side down. Cook 4-5 minutes until skin begins to brown and crisp. Flip fillets and cook another 3-4 minutes or until beginning to crisp and are cooked through. Plate and sprinkle dill over fish fillets. NOTE*: I like the extra flavor from a well made GHEE, but butter or olive oil could easily be substituted.